Fire Breath is a shout that deals fire damage to enemies, and potentially staggers them as well. Its use does not increase XP for the Destruction skill. Meditating on the word Yol with Paarthurnax grants the player The Fire Within, an ability which increases the damage from this shout by 25%. Dragonborn adds the Dragonborn Flame ability which summons a Fire Wyrm for 60 seconds when an enemy is killed with the Fire Breath shout. All available words of the shout must be used for a Fire Wyrm to appear. If multiple enemies are killed with the shout, multiple Fire Wyrms will appear. The Fire Wyrm itself is similar in appearance and behavior to an Ice Wraith. It is resistant to fire and uses a "Fire Bite" attack. When killed or when its timer expires, it explodes, dealing some damage. Unlike other summons, the Fire Wyrm will not follow the player. 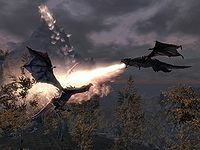 It is best to kill weaker enemies at the start of a fight with the Fire Breath shout, so the Fire Wyrms can help against stronger enemies of a group. hot as (the) Red Forge. The second and third word of this shout make it increasingly less efficient when it comes to damage per second (dps) per second of cooldown. The first word alone does 1.6 damage per second of cooldown, while the second word and third word only do 1.4 and 0.9 damage per second of cooldown, respectively. If none or only one of the words of the shout Fire Breath is known when you first approach Paarthurnax at the Throat of the World, and you have a dragon soul in stock, you can use the soul to learn the newly found word on the wall before Paarthurnax unlocks it for you. This results in the "soul" from Paarthurnax teaching you the next word of the shout. This way you can learn two words of the shout at the same time. If you do this when you have no words for Fire Breath, the next word wall for Fire Breath encountered will not unlock the final word. All three locations will still need to be visited to unlock the final word. If you have unlocked one word, you do not have to visit the final location; however, it will still run the animation as if you were learning the word. This page was last modified on 24 June 2018, at 17:35.